After Iranian Kurd escapes detention facility and is found dead, migrants take over site and set it on fire as guards abandon them. The issue of migrants from the Middle East is creating tensions throughout the western world, but on Monday those tensions were seen clearest at Australia's Christmas Island detention center, as migrants rioted and set fire to the facility. At the facility on Christmas Island, located 2,650 kilometers (1,650 miles) northwest of Perth and just south of Indonesia, migrants lit fires damaging medical, educational and sporting facilities, reports BBC. As of Monday morning government officials say the "major disturbance" is still in its full throes, and that guards have been pulled from the site for "safety reasons," even while denying there was a "large-scale riot." The violence appears to have been set off by Iranian migrants who started protesting the death of Fazel Chegeni, an Iranian Kurd, who broke out of the facility on Saturday. His body was found at the bottom of a cliff on Sunday, with a report on his death currently being prepared. But the protest quickly spun out of control, as "other detainees took advantage of the situation to engage in property damage and general unrest," according to the officials. "A group of detainees, believed to be non-citizens whose visas have been cancelled under mandatory cancellation provisions, continue to agitate and cause damage to the facility. There are no reports at this time of any injuries to detainees or staff." One 25-year-old detainee Matej Cuperka was quoted by ABC News, saying that he feared for his life due to the rioting. "They are starting fires everywhere...they have broken into the canteen, into the property area," Cuperka revealed. "There are cars full of officers driving around the complex. They are just having a look through the window, but nobody is helping us." 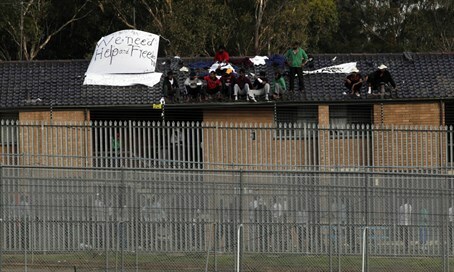 Senator Sarah Hanson-Young of the Greens party condemned the incident, saying the facility was "in meltdown." "With all Serco guards being removed from the center late last night, the people who are locked up there are being left to fend for themselves," she said, warning that asylum seekers apparently were locked up together with other detainees, putting them "at risk."